The unfortunate side to all of this is the potential Webroot has in its hands. Webroot is one of a HANDFUL of antivirus suites created, maintained and built in America. Why is this such a big deal? Just do a search of the top 10 best antivirus suites and then search where they are based out of. It's kind of scary to think the BEST antivirus suites are based in, more or less, old eastern block nations with nasty hacking ties. I selected Webroot Total because it offered everything I was looking for (except VPN for my mobile phone). That LARGELY depended on a PASSWORD MANAGER. Now, I hate to say it, but if this issue cannot be resolved within a week, I WILL be asking for a FULL refund for my purchase. How do you think to update antivirus with the latest Firefox update and not the PM?!?!? A consumer-ready product is just that: Instantly ready for consumer use with all of its advertised components ready to go. Shame on you Webroot. Shame. Honestly @BurnDaddy, I've loved Webroot since I switched over back in January (I think). I do have problems with PM on my Android but I'm still looking into fixes for that. However, the loss of a PM is a MAJOR dealbreaker if not addressed any a VERY timely manner. We've all seen Norton and Mcafee degrade over the years and I've been very excited using Webroot. I really think, with a little more polish and behind the scenes coding, the US could finally have a competitor to Kaspersky! All I can do is hope. I left Kaspersky for Webroot 6 years ago and I have never regretted that decision. I don't believe Webroot has ever been on par with Norton or McAfee. They were both degraded from the beginning, imho. Webroot is one of a HANDFUL of antivirus suites created, maintained and built in America. I hate to correct you, Powderworks (I am very much liking your posts :D) but Webroot SecureAnywhere was created in the UK by Prevx (it was called Prevx 3.0). Prevx was then acquired by Webroot in 2010, and the whole team of Prevx programmers were brought over to Webroot and rebuilt Webroot entirely from scratch. Thus was born SecureAnywhere. Regarding Password Manager, I am afraid that at present I don't use a Password Manager. However, Webroot PWM is a white label version of LastPass PWM, and according to Neil Rubenking, a rather outdated one. Maybe he is wrong, but according to his November 2017 review it is far from being the best. Usually, he has an extremely high view of Webroot SecureAnywhere but in this review he marked down the Internet Security Plus version considerably as a result of weaknesses of and problems with its PWM. In another review, he speaks very highly of the free version of Last Pass PWM. Then again, I stand to be corrected on all this by anyone here who uses Webroot PWM. By the way, regarding Webroot becoming a worthy competitor to Kaspersky, there are many who think that it is already superior to Kaspersky. You should speak for example to @Baldrick here who has had experience both of Kaspersky and of Webroot and hear what he has to say. See also these posts: here (you will need to follow this thread through to the end) and here and here (you will also need to follow this thread through) and here and here. Yes, I'm afraid I agree with you, @Powderworks. Aesthetics have unfortunately never been a forte with Webroot. It took me a while to become reconciled to that fact <sigh>. But hey, I'll live with that if I have to. Regarding PWM, this is my take on the various bells and whistles of WSA. I'm mulling over finally getting a PWM, but if I do I may well go for LastPass Free PWM. The lack of being able to use the password manager in Firefox 62 is bad enough. It is atrocious that this issue isn't being dealt with quicker (bad business model). To make matters worse, when logging into my control profile, I can't even access it there to download. It is not acceptable to tell people to use different browsers. It is not acceptable to make it difficult to find information on this problem, and it is not acceptable not to provide emailed updates as to the status to fix it. It is not acceptable that users have to waste their own valuable time to deal with this. I rolled back Firefox to the last version before 62. 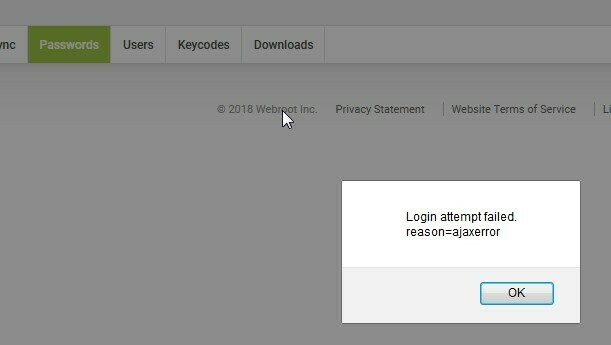 The password manager add-on then reappeared, however when attempting to log into it, on two different computers, I get a failure notification due to server error. One remaining computer that I managed to block from upgrading to 62 can still log into password manager, but when I accessed my profile console, it gives me an error when I try to get into the password section there. 100% unacceptable. What I'd like to know is if this is being taken care of, or is it time for me to part ways with Webroot. Further, because I NEED TO GET MY PASSWORDS, I installed Chrome just to see if I could access them there. I installed the add-on, but it WILL NOT allow me to log on. Instead, I get the same "an error occurred while attempting to contact the server. Please check your internet connection" message I'm getting on Firefox. There is nothing wrong with my internet connection. What's wrong is whatever Webroot has done or not done to fix this situation. It's really not funny at all. I've said it many times before and I'll say it again. I think that Webroot should concentrate on what they're good at: their outstanding anti-malware product (based on Prevx's revolutionary technology created in the noughties, and which they acquired in late 2010) and, perhaps, their good and reliable System Optimizer (based, I believe, on their, at the time, highly acclaimed Window Washer). All their other bells and whistles (Personalized Security Report, System Analyzer, Password Manager, Backup & Sync—although it is possible that the Backup portion of the latter is an exception to the rule—and whatever other whistles I may have forgotten) are too often mediocre and/or flakey. There are better—sometimes far better—and often free, options on the market. It would be a mistake, imo, for Webroot to decide to create their own Password Manager. Not only would this mean dissipating too many of their precious resources away from what they are outstanding at, but this product, too, could risk being flakey and unreliable. As @Baldrick has said in the past, better to be the Master of one than the jack of all trades! I beg to differ with all the issues Webroot has been dealing with the Password Manager over the years so you can keep your two cents. No problem-o, Daniel. My opinion (and maybe I'll be proved wrong ;)). In addition to the internet error message on Firefox, Edge, and Chrome. This what I am getting when logging into the Password section of my console. Its not just a Firefox issue. I purchased a new computer today and freshly loaded WR. There is something wrong at Webroot. Additionally, there has been no reply to my trouble request for a few days. WEBROOT what is going on? I just called in. I was told this is two problems, one being the firefox upgrade, the other being the inability to log into the password section of the console. I expressed this is not only my problem, but a problem for everyone, and that it's unacceptable business practices, etc. My call was "escalated" after my information was gathered, and I was told a technician will get back to me, at an unknown date or time, to help me see if I can get into my passwords in the console. I wish I was optimistic, but at least I got to say what was on my mind about this long delay and lockout. In regard to that message from Webroot support, I did respond asking WHEN they plan on fixing this problem, since this answer is just filled with more vagueness. We had a working fix but in a attempt for the WR DEV team to fix the current login server from a old one to new one, something went wrong. Now the roll back method was okay/ and - now NOT WORKING and any login attempts just fail to connect with FF 61.0.2 version. I should have downloaded my entire WPM to cvs file, now i have to find a entry point to WPM to retrieve data since email login fails for WPM. Well... knock on wood I did a system restore to before the Firefox update then turned off update, rolled back Firefox and have not had and login troubles or use issues since. You should be able to access the credentials you have stored, using Password Manager, via your online account/web console. If you sign in once on the dashboard select/click on the 'Passwords' tile and that should present you with all of your password data stored in the Webroot Cloud. If you look to the top right of the panel you should see a list of options entitled "MyIdentity actions" and therein you should see an option to "Export data". Click on that;you should be asked to re-enter your master password, and then presented with a panel entitle 'Export options' from which you can print or export the data in a number of different formats. Try ESR version. Should work. Firefox ESR is intended for system administrators who deploy and maintain the desktop environment in organizations such as schools, governments and businesses. Have you tried to log in on a tablet or smartphone? The last tine this happened I logged in with my ipad pro and screen shotted my passwords. Not a bad idea! I didn't even think of that. Although I don't recommend writing down or screenshotting passwords. If somehow you lose your device/paper or someone steals it they then have all your passwords to your accounts. Even with two factor authentication enabled there is usually an option to send it to the email address on file and if they access your email because they have your passwords they will get right in.